U.S. Drops Cuba From List Of State Sponsors Of Terrorism : The Two-Way The State Department removed Havana from the list following a thawing of relations with the United States. 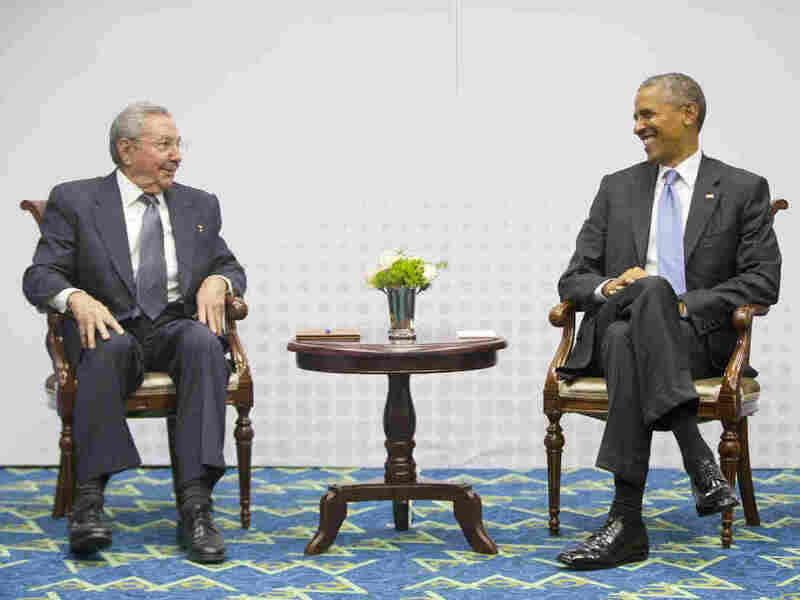 President Obama with Cuban President Raul Castro during their historic meeting in April at the Summit of the Americas in Panama City. The U.S. State Department announced Friday that Cuba has been dropped from a list of state sponsors of terrorism. "The rescission of Cuba's designation as a State Sponsor of Terrorism reflects our assessment that Cuba meets the statutory criteria for rescission," the department said in a statement. "While the United States has significant concerns and disagreements with a wide range of Cuba's policies and actions, these fall outside the criteria relevant to the rescission of a State Sponsor of Terrorism designation." National Security Council spokeswoman Bernadette Meehan, in a blog post, conceded that "while the United States has significant concerns and disagreements with a wide range of Cuba's policies and actions, these fall outside the criteria relevant to the rescission of a state sponsor of terrorism designation." "For 55 years, we tried using isolation to bring about change in Cuba. But by isolating Cuba from the United States, we isolated the United States from the Cuban people and, increasingly, the rest of the world," Meehan wrote. The move follows last month's historic meeting in Panama between President Obama and Cuban President Raul Castro. Reuters notes: "The removal of Cuba from the U.S. terrorism list eliminates an obstacle toward restoring diplomatic ties between the United States and the communist-led Caribbean island state after 54 years." The decision comes after the White House fulfilled a 45-day pre-notification of the change to Congress. As NPR's Sam Sanders reported on April 14 — when the White House submitted the request for review of Cuba's status — the move is a major step in normalizing relations between the two countries. In an interview last month with Morning Edition, President Obama said that the change in the relationship with Cuba is "a real opportunity" for both countries. "Our hope is to be in a position where we can open an embassy there — that we can start having more regular contacts and consultations around a whole host of issues, some of which we have interests in common," the president told Morning Edition host Steve Inskeep. Removing Havana from the list lifts some sanctions, but others would remain in place, according to Roberta Jacobson, assistant secretary of state for Western Hemisphere affairs. Speaking to All Things Considered host Robert Siegel last month, Jacobson said that "it is as much a change in reputation" as it is about sanctions. "To be on that list is a mark in some ways that countries bear. But it does take them off of certain forms of sanctions that they will no longer have to be constrained by," she said.